People always assume that I am a fanatical lover of taxidermy, a lifelong devotee, perhaps even a compulsive collector, and that my book, The Breathless Zoo: Taxidermy and the Cultures of Longing, is an adoring homage to all things dead, stuffed, and mounted. It is not just the word "longing" that seems to mark me as a taxidermy lover. There is something sufficiently peculiar (read unexpected, off-putting, or downright disturbing) about the lively posturing of animal skins that suggests only an aficionada could possibly write a book on the subject. If I had written a history of slavery, no one would assume any such thing. I don't love taxidermy. I don't collect taxidermy. But for six years of my life, I found it irresistible. My taxidermy years didn't grow from love, but they did begin with an unsettling sort of fascination. Like a moth irresistibly drawn towards a bare bulb, I have been all-consumed. Some might say obsessed. I've visited natural history museums and private collections across the western world. I've written about taxidermy, curated exhibits about taxidermy, photographed, blogged and talked about taxidermy. I've seen the beautiful, the devastating and the repugnant from haunting works of contemporary art to ancient animal remains lost in almost-forgotten museums. Through my website Ravishing Beasts, I've corresponded with lovers, haters, activists, and kooks (one reader let me know he had smoked the ashes of his dead cat), all because of the unnerving charisma of long dead animals. For me, obsession and fascination don't equate with love and adoration, and a thing can only fascinate for as long as it retains its inexplicable magnetism. I'm sure you've all had an encounter with taxidermy, whether it was with a museum specimen, a hunting trophy, or a piece of contemporary art. If you gave the animal more than a passing glance, you know something of taxidermy's uncanny mesmeric presence, the way it draws your eyes and demands attention. You can't ignore a stuffed parrot on the mantelpiece in the way you might overlook a ceramic vase, and my fascination with taxidermy was really an obsessive quest to explain why. Why does the artistic recreation of an animal using the animal's own skin (undeniably a very odd practice) create such eerie animal-things? I'm a meat-eater and wear leather shoes. Like most of us, I use all sorts of animal product in my daily life, but during a visit to the Natural History Museum in London a half decade ago, taxidermy suddenly stuck me as something completely "other," something stranger, darker, more provocatively intimate and alluring than anything I had ever encountered. Taxidermy captivated me against my will, and I couldn't look away until I knew its secrets. And this is what I now know: all taxidermy is an unnerving and unknowable thing. Although taxidermy requires death, it is not motivated by brutality but a longing to capture animal beauty. It is motivated by the desire to tell ourselves stories about who we are and our place within the larger social and natural world. It is driven by what lies beneath animal form, by the metaphors and allegories we use to make our world make sense. And lastly, taxidermy is always a gesture of remembrance: the beast is no more. Taxidermy rebuilds animals with human longing. No longer purely animal, nor fully human-made, taxidermy is infinitely more than the sum of its parts. Technically speaking, the tanned skin of an animal stretched over an armature and adorned with glass eyes is really nothing more than a fancy species of upholstery. But encounters with taxidermy are as fundamentally different from encounters with leather sofas as they are from encounters with living animals, photographs of animals, or videos of animals. Taxidermy isn't a sculpture or interpretation of an animal. It still is the animal but forever blurred with human desire. After all, taxidermy wants time to stop. To keep life. To cherish what should have long passed from view and savour its form immortally. There is something inherently disconcerting about such insatiable, unfulfillable longings. And perhaps this is why I am labelled as a taxidermy lover: the subject is simply too darkly unknowable for the uninitiated to enter. Rachel Poliquin is the author of "The Breathless Zoo," due out in August 2012 from Penn State University Press, and currently available for pre-order. 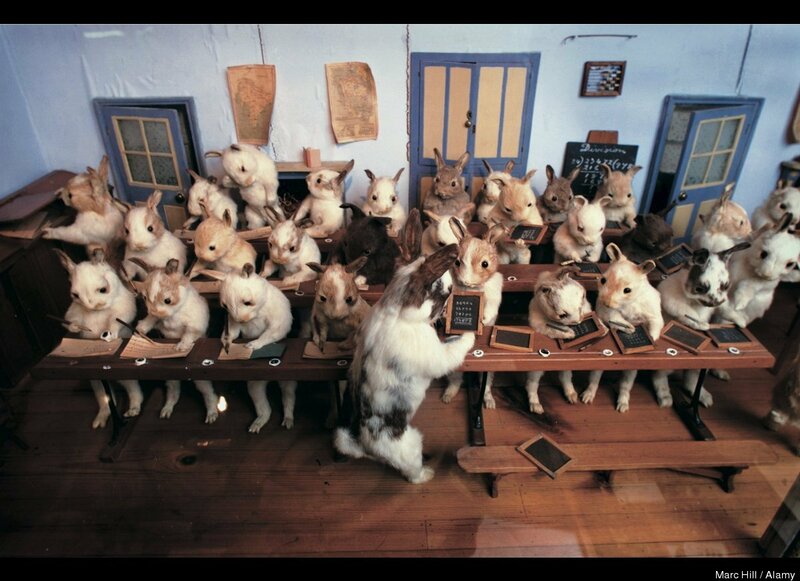 Walter Potter, The Rabbits' Village School. Photo copyright Marc Hill / Alamy.